LUKE AIR FORCE BASE, Ariz. -- It was October 2008 in Afghanistan during Operation Enduring Freedom. A Marine had been shot twice in the arm, another in the helmet and the Marine Special Operations Team had three of their weapons damaged by fire. They were outnumbered 11 to one and in desperate need of air support. The enemy began overwhelming them with rocket-propelled grenades, heavy machine guns and small-arms fire. The last building they found cover in had been struck by more than 20 rocket-propelled grenades causing the walls to crumble forcing the team into their last few defensible rooms. For more than two hours the team repelled three attempts by the enemy to breach their cover. They were approaching a hand-to-hand combat situation. Two sections of F-18 Super Hornet fighter jets responded to the Marines' request for close-air support but couldn't help them because they would not fly below the clouds covering the mountains below. Shortly after, the Marines received word that two A-10 Warthogs, one flown by 1st Lt. Aaron Cavazos, penetrated the cloud cover and found a way into the tight valley. While the A-10s diverted surface fire to themselves by using overt lighting, they were able to identify friendly and enemy positions allowing the Marines time to develop a plan. The Marines quickly moved out of the compound to an eight-foot wall north of their position while engaging the enemy who was as close as 10 feet away. As they pushed north from the wall under heavy enemy fire, they heard the sound of the 30mm guns in support of their movement as A-10s made the first of a series of low-angle gun runs closer than 50 meters away. Because of the heroic actions of then 1st Lt., now Capt. 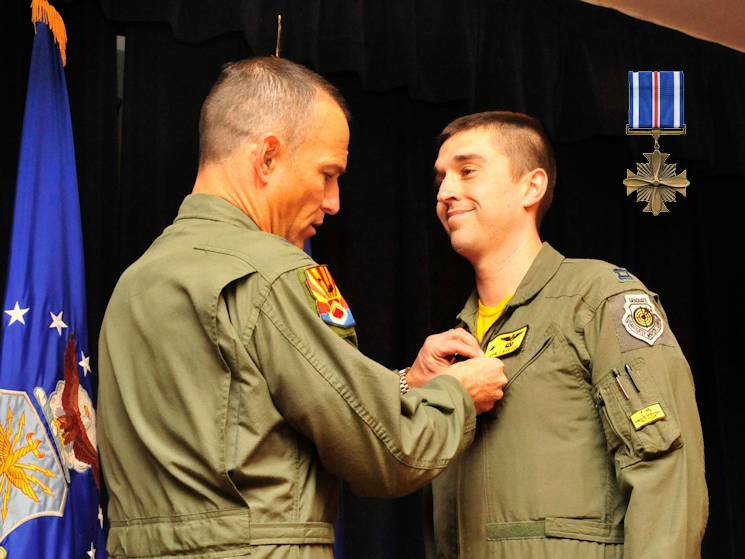 Aaron Cavazos, 61st Fighter Squadron weapons officer, the lives of those six Marines were saved, earning him the Distinguished Flying Cross with Valor, which he received on Jan. 16, 2015 in Club Five Six at Luke Air Force Base. "The biggest reward for me in earning a second Distinguished Flying Cross was that my friends and other pilots within the squadron thought highly enough of what we did that night to nominate us for the DFC with Valor," Cavazos said. "It's a huge honor for me to have received this award today." To one pilot, Cavazos is the essence of what a fighter pilot should be. "Captain Cavazos is the epitome of a fighter pilot who lives by the warrior ethos," said Lt. Col. Michael Ebner, 61st FS commander. "In this case, he truly placed service before self. He risked his own life by doing what others would not do in order to save fellow service members' lives. His bravery and selflessness are second-to-none. Without his heroic actions, several Marines would have died that day. He is a testament to the integrity, honor and valor passed down through generations of American warfighters such as Gabreski, Risner, Olds and many others."